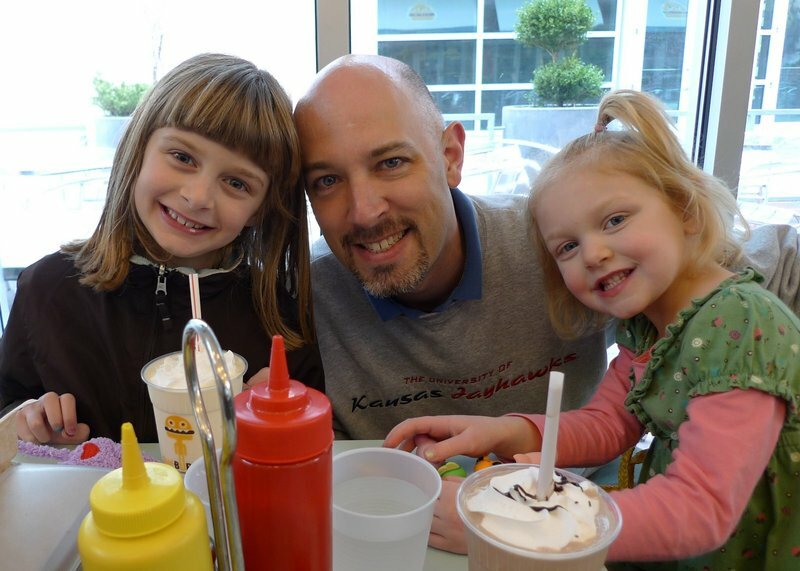 Before the snows hit us Friday night, we took the nieces to downtown Kansas City’s Power and Light District, for a special “uncles and nieces only” lunch at Chef Burger. Ava bundled up on a chilly afternoon. The Power and Light District is a new entertainment zone in downtown KC that was finished in the last year. In an attempt to revive the mordant downtown, the KC government has worked with developers to build housing, restaurants, new theatres (live stage as well as a cinema), and shopping (including a Costentino’s grocery store that is very nice). If we moved here, I could imagine buying a place downtown. The girls with me, waiting for the burgers to arrive. 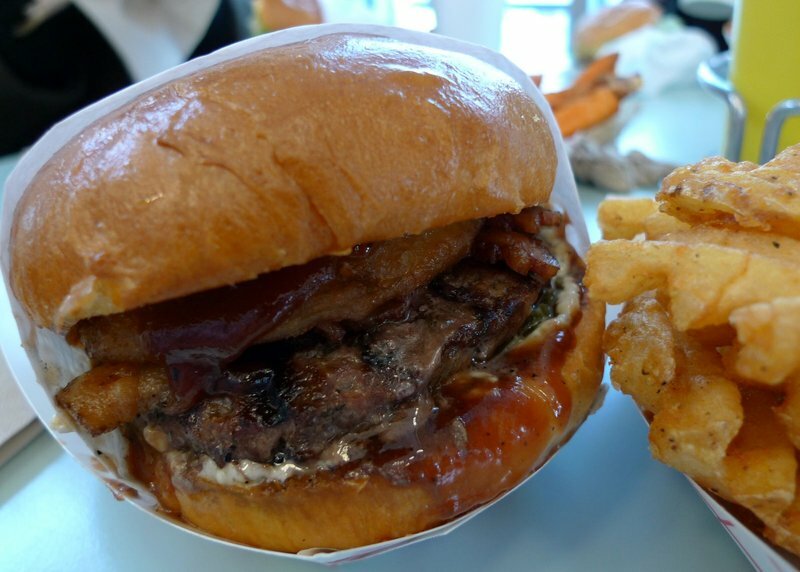 This burger has bacon, an onion ring, barbeque sauce, and blue cheese. It was wonderful. Especially the bun, which is a freshly-baked egg roll. Sweet potato fries. Emily wouldn’t try them since they had the words “sweet potato” in the name. 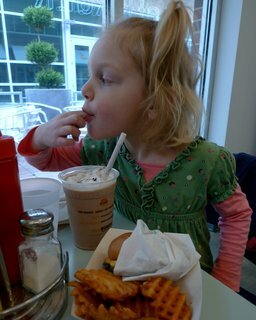 Ava, however, thought they were much better than the waffle fries. 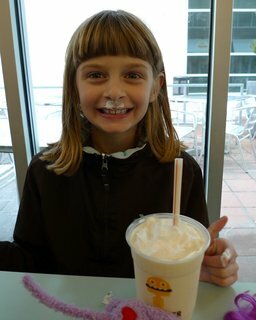 Ava and Emily enjoy their real ice cream shakes. Needless to say, the majority of the calories consumed were in liquid form. 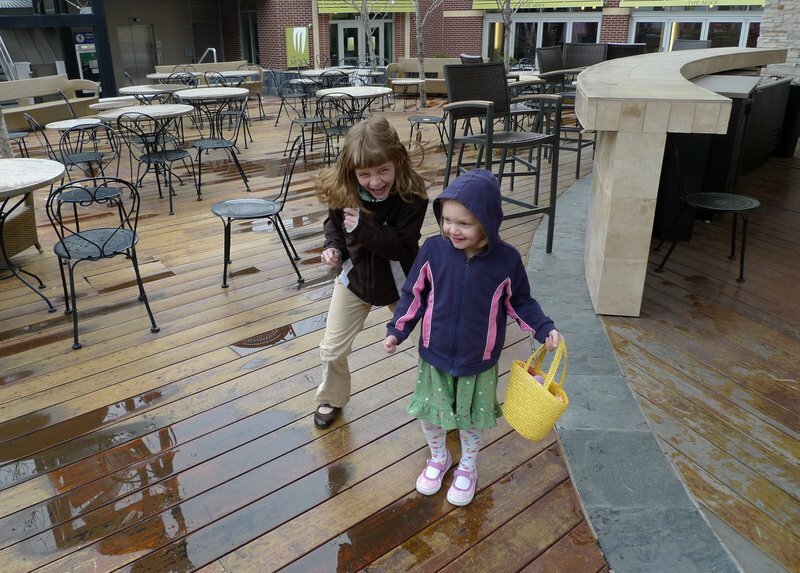 Afterwards, Emily and Ava practiced some tap dancing steps on the hardwood deck outside the restaurant before we walked back to the car. Stopping at Cosentino’s grocery, we bought some chocolate truffles, everyone picking one truffle each. I bought a curry truffle which was decorated like a pair of dice. The girls wanted to try and although I warned them they wouldn’t like it, they surprisingly did. “Tastes like pumpkin,” said Ava. Anything that’s covered in chocolate must be okay. We stopped by my grandparents’ house, which isn’t that far from downtown. 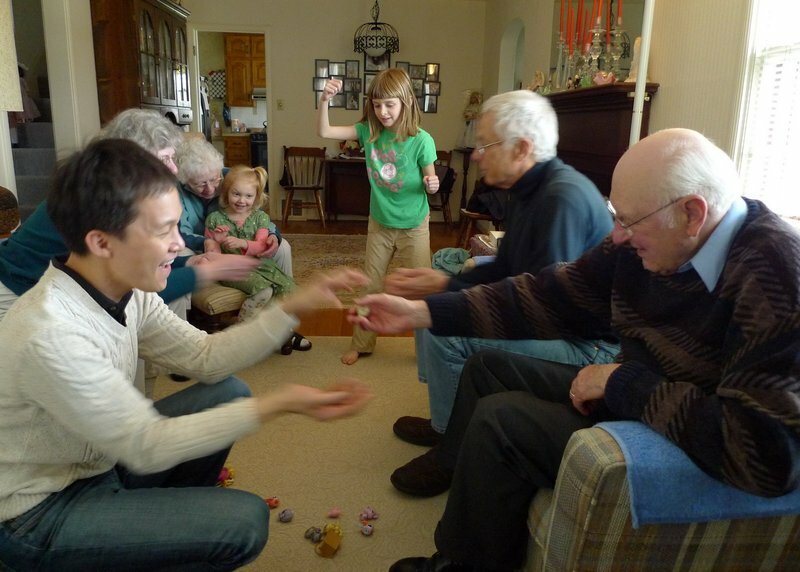 My parents were there, too, so we enjoyed a game which Ava and Emily directed. Kind of a version of musical chairs in which we passed toys from person to person and whomever did not have a toy when the music stopped, was deemed “out”. Later in the day, back at my sister and brother-in-law’s house, it was time for some exercise. Tawn showed the girls some yoga moves. Today is our last day in KC then we’re off to New York tomorrow. Just a few days there and then we head back towards the Pacific. Obviously, my entries are a bit off chronologically. Bear with me, please. 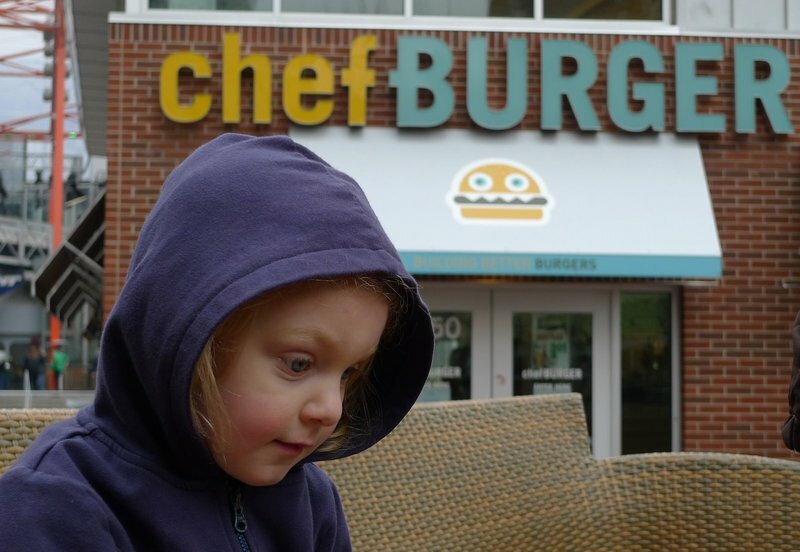 This entry was posted in Uncategorized and tagged Burger, Chef Burger, food, Kansas City, travel, Yoga by christao408. Bookmark the permalink. Lovely pics of the girls and family ! That game sounds fun. Enjoy the rest of your vacation. That burger looks absolutely mouthwatering, and I just love sweet potato fries. Aaw, I love seeing all these pictures, with you and family members having such fun times! Thank you for sharing them. Danicing in the rain, the girls are so cute! You have a wonderful family, and very happy to see that Tawn fits right in. Very very happy for you, and safe travel. I absolutely adore the family shots. The food shots make me want to just bite into those fatty, greasy bacon burgers!!! Great family photos as usual your nieces are adorable! It’s good your new camera is getting is fair use! That burger looks amazing… oh my. Hahaha! 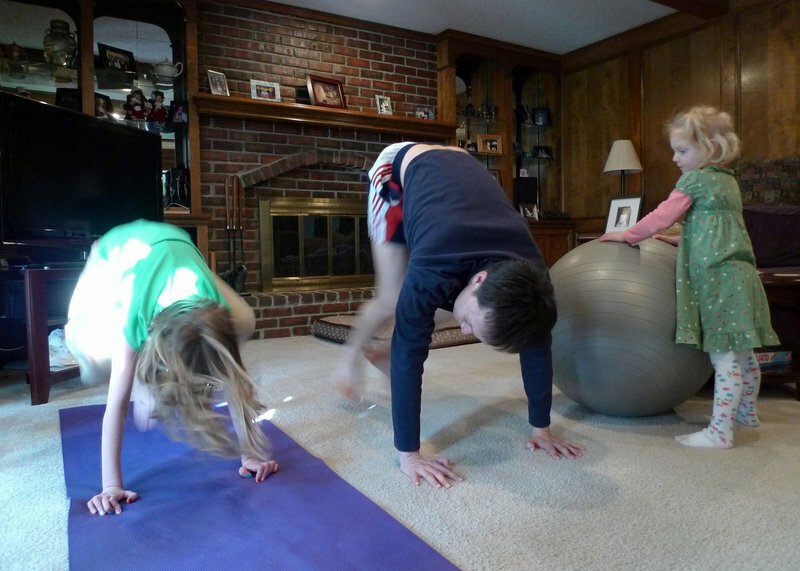 I love the photo were Tawn’s teaching yoga. I just downloaded a yoga podcast and man, I just can’t do it. I don’t understand the yoga jargon so I should download a video next time. :o)And man, the food looks so good and greasy! Mmm!!! Hope you guys had fun in KC and hope you enjoy New York! SHOPPING! Would you look at that burger!? It is humongous. 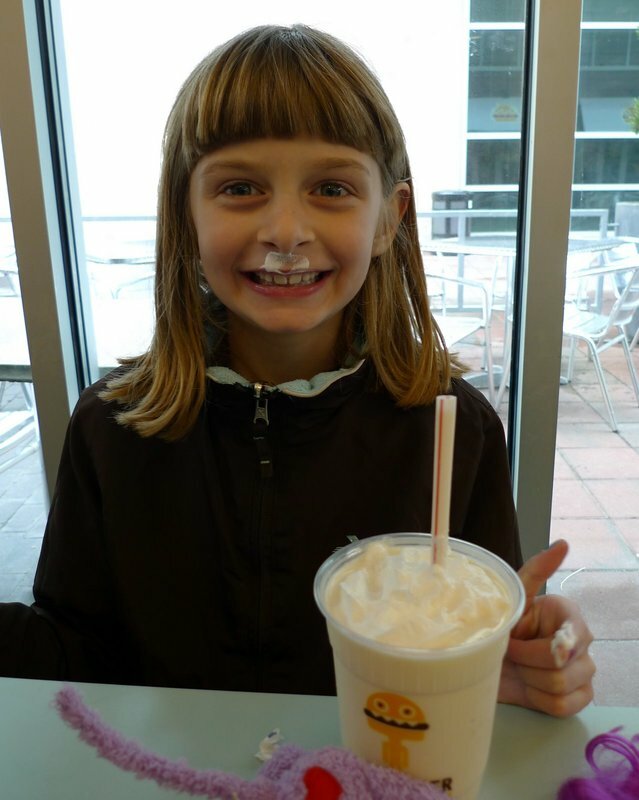 Milk shakes? That reminds me, I have some apple pie I need to warm and top with ice cream and have it JUST NOW. How nice to spend quality time with the family! The burger and fries looked very good indeed! Have you ever had Okinawan Sweet Potato fries by any chance? We do them here in a very light tempura style batter; absolutely delicious. @secade – They are pretty cute, thanks. @arenadi – Oh, THAT sounds very good. You make them? Maybe a trip to Hawai’i is necessary then… @lil_squirrel4ever – So do I! @iskrak – We arrive Monday afternoon and depart Friday morning. Just visiting a few friends, some family members, and going to see “Wicked” on Wednesday. @ZSA_MD – Don’t wait a minute! @CurryPuffy – It was nice to be able to spend time with the family. @kenpcho – Don’t really need to understand the jargon; just follow what everyone else is doing. @Senlin – Oh, I completely agree. Sweet potato fries have a TON more flavor. @Dezinerdreams – @ElusiveWords – @osmundaregalis – It sounds like the food pics were universally popular on Xanga. @TheLatinObserver – I’ve been happy with the camera so far. Can’t wait to break out the 18mm lens attachment. @julieae – @Chatamanda – Thank you. @stevew918 – Tawn’s been an integrated part of the family for many years now. I’m very glad he feels so comfortable with them. @decembriel – You’re welcome. @yang1815 – Bring it on! I prefer sweet potato fries way more than regular fries. The sweet and salty combo is soooo good! @christao408 – Flights are around $500?! @yang1815 – What dates are you checking? Summer is high season and there may be some events going on around then. Should be something more like $350 each. Have fun in NY! I was just there yesterday now going back to SJ for a few days. @christao408 – Oh, yes 🙂 Actually, they were best from a restaurant I did work for; I’ll look for a photo and post it. @christao408 – All weekends in July from OMA. Which airport? I assumed YYZ? Sweet potato fries! I have given up eating fried most things but I’ll break training for the sweet potato fries without hesitation. (and those looked especially good) The neices are growing up and cuter every time you post! @yang1815 – Yeah, YYZ. Hmm… must be a popular place in the summer. @Shades_of_Athena – Thanks for leaving it rainy for us! =D@arenadi – Can’t wait to see them but, even more, I can’t wait to try them! 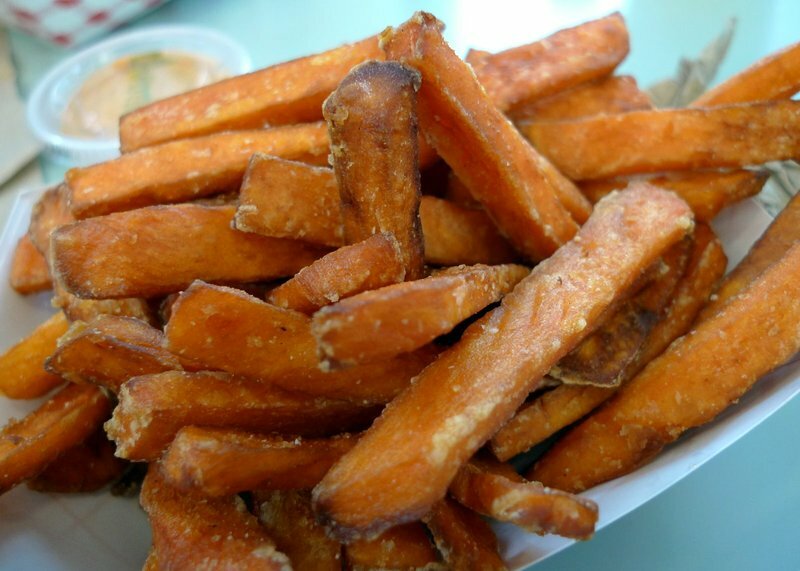 @murisopsis – Plus, sweet potato fries are full of healthy nutrients and vitamins. Thanks for the comment on the nieces. @christao408 – Yeah must be. We probably won’t go if the price stays around that range just FYI. This is such a cute family interaction.Puts a smile on my face.